200 Earnest Byner St. W.
From the Baldwin County Courthouse, go west on Hancock Street for 2 blocks or 0.2 mile (or the one large block containing Georgia College & State Univ.). Turn right on Clarke Street. Go one large block or 0.2 mile. Turn left onto Highway No. 22 (west) or Montgomery St. Follow it for 0.6 mile to a fork. At a fork, bear left and remain on Montgomery. Continue for 0.1 mile or until Montgomery dead ends into the cemetery and Chatham / Earnest Byner St. To enter the cemetery, turn left on Chatham and go around the cemetery to the gate. 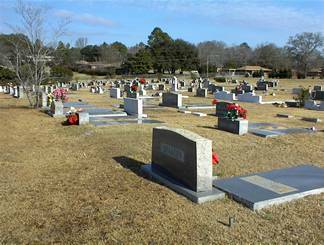 Click here for diagrams of the cemetery and section C.
Complete list of Section C graves as of summer, 2002. Ga. PFC 773 Medical Svc. Co.
Picture and engraved guitar on grave. We miss you, David. Empty-appearing lot as of summer 2002. Middle name per obituary. Is in a sublot of lot 2. Shares headstone with Doris Keen Nunn. Is in a sublot of lot 4. "Beloved husband and father" Shares headstone with Sallie Usery Parker. "Beloved wife and mother" Shares headstone with Sidney Harris Parker. Infant s/o Cyrus L. and Joy N. Giles. Only one date - birth and death assumed. Infant d/o Cyrus L. & Joy N. Giles. Only one date - birth and death assumed. "In loving memory of Mama"
"Daughter" No death date as of summer 2002. Empty as of summer 2002. "Mama" On same headstone as Dennis M. Tolbert Sr.
Our beloved mother. A tender mother and faithful friend. No dates on stone as of summer 2002. On same headstone as Louis Charlie Foster Sr. Same grave as Randy Sanford. Same grave as Danny Sanford. m. Catherine M. Arnold, Nov 5, 1949.
m. Jonah Arnold, Nov 5, 1949. No death date as of summer 2002. On same gravestone as Maggie Wade Simmons. On same gravestone as Glenn Simmons. Infant s/o Bill and Cynthia Minor. "Our little angel". Only one date on stone - birth and death assumed. "Daddy" "A loving husband and father and a man you could truly call a friend"
"A loving wife, a tender mother and a faithful friend"
No death date as of summer 2002. Only one date. Infant grave. Birth and death date assumed. In a separate lot from person 1. In same lot as Francis Marion Williams. Only one date give. Birth and death assumed. Maiden name and dates per obituary. No death date as of summer, 2002. Ga. Pvt. Co. L, 6 Inf. Regt. Ga Sgt Co B 2BN 4 Inf Div. On same gravestone as Byrd Maddox Richey Peacock. w/o U. E. Shannon. "Mother"
m. Dec 28, 1937 to Joseph W. Eller. Maiden name per obituary. Our son at peace. On same gravestone as Joseph W. and Helen P. Eller. MA SP5 U.S. Army Ret. "Mother" Maiden name per obituary. Ga Cpl U.S. Marine Corps Res. Is in a separate lot from graves 1 and 2. Let your heart be not troubled. On same marker as Doris Eller Roberts. No death date as of summer 2002. On same marker as Scottie Ray Roberts. Our special angel. We love you. Rest is thine and sweet remembrance ours. s/o Louie T. and Annie Combs. Beloved Husband and Father, Faithful Son. There is rest in heaven. We all love you. He has gone to the mansions of rest. To the memory of Charles Benjamin Hodges, Placed by Nieces and Nephews (on a bench). Lot marker with no visible graves. Our beloved brother. Love you always. Only one date appears on gravestone. Birth and death assumed since infant grave. m. Apr 20, 1946 to June Massillo. No death date on gravestone. m. Apr 20, 1946 to Charles Massillo. No graves - empty as of summer, 2002. "Mother". No death date as of summer 2002. On same gravestone as Willie L. Cooper. "Bud" "Father". On same gravestone as Joann J. Cooper. No death date as of summer 2002. On same marker as Louis "Blade" Huley. "Husband, Father, Community Leader, City Councilman 1992-2000"
In loving memory. Engraving of an earth-moving machine on headstone. Precious memories celebrating the life of "Big Jock"
Our beloved husband - father - grandfather - brother at rest. Devoted to God and family. New grave as of December 2003. "Founder, Overseer, Pastor". Her children Willie Jr, Mamie, Thelma, Jasper, Geraldine. Hard Fighting Soldier. Love, Rest in Peace. Masonic emblem. A small pillow covers a seemingly small grave. "Elder" m. Oct 25, 1964. We love you. A new grave as of December 2003. New grave as of Dec. 22, 2003.
b. Valdosta, Ga, d. Milledgeville. s/o Roy Linton Cox Jr. and Rachel Gregory Cox. b/o Martha Lillian Cox, Mary Vivian Cox, Evelyn Gregory Cox. b. Chatsworth, Ga, d. Milledgeville. d/o Seth Cleveland & Mary Peeples Gregory. m/o Martha Lillian, Mary Vivian, Roy Linton III, Evelyn Gregory Cox. m. May 16, 1942. Flowers with "Mom" are on the grave. Infant s/o w. C. & Patsy C. Culbertson. One date on stone. Birth and death assumed. s/o Charlotte & Robert M. Smith. "Slats" May belong in lot 15.